Produced by Peter Knight Jr. at Pye's Marble Arch studios on 27 Feb 1963. 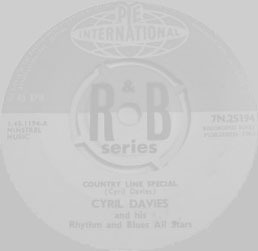 On Tuesday, 7th of January, 1964, Cyril Davies died and the R&B scene lost a major figure. A man devoted to and steeped in "his kind of music", Cyril had gradually over the years been building up to the day when he could present the "Blues" that he loved in the manner which he favoured. No stranger to jazz, "Skiffle" and folk music, Cyril had enriched all these scenes himself and had been enriched by them, augmenting his own ideas with facets of these idioms, and developed his own driving musical excitement. With the Muddy Waters style as a basis and with Sonny Terry and Jimmy Cotton as instrumental "heroes" Cyril was without doubt the only real R&B harmonica player in Britain. It was a tragedy when he died so young! On this E.P. are his last four recordings - "The Sound of Cyril Davies". A.T.V. House, GT. Cumberland Place, London, W.I.